The High-Tech Giant CMM - CMM Inc. 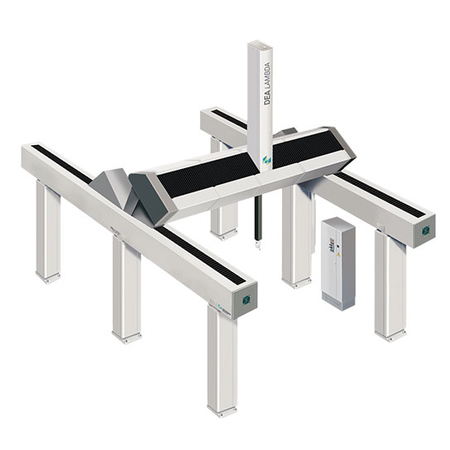 The DEA LAMBDA SP is a line of very large measuring machines, designed for operation in the industrial fields and rugged shop-floor environments. Offering superior measuring volume and excellent metrologic performance, this particular CMM allows dimensional inspection of very large precision components, such as marine engines, aircraft frames, satellite modules, nuclear vessels, turbines and much more. The DEA LAMBDA SP features a dual drive and Y axis dual encoder system. Carriage yawing and structure deformations (which are frequently created during machine motion) are monitored by a distributed sensor system and compensated in real time; this configuration ensures higher dynamics and advanced measuring accuracy. The outstanding performance of this machine results from advanced technical solutions like the dual drive/encoder system on the main carriage, the Slant Bridge technology and the ACTIV® structural temperature compensation.